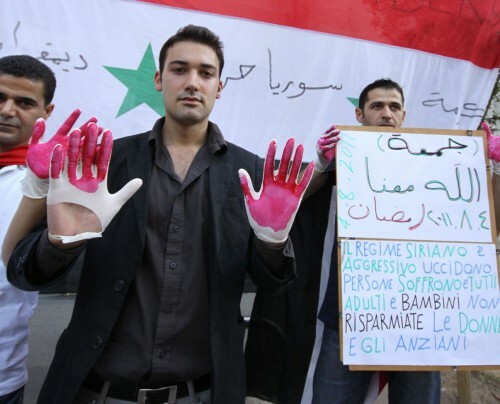 In the days in which the city of Homs is under massive shelling by the Assad Regime and there has been a call for the evacuation of Americans from Syria, the writer and activist Shady Hamadi, born in Milan in 1988 from an Italian mother and Syrian father, writes an appeal to the Italian and International Community so that they forcefully condemn the massacre of unarmed people that is happening in his country of origin. His appeal seems to me to be a cry of anguish which we should not ignore. Shady Hamadi (photo) is a son of a leader of the Arab Nationalist Party in the region of Homs who underwent the torture of electrical cattle prods in the regime’s cells and at the end of the 1960s, was able to flee to Italy. A student of Political Sciences, Shady has already exposed himself on many occasions. He has given interviews on TV and web networks (“We can break the wall of fear”), and he is among the members of a Facebook community “Comunità siriana in Italia”. He is in contact with opposition figures in Paris and last year his book Voci di anime was published. It is a spiritual voyage in the search of one’s identity that is divided between two cultures. In the letter that we publish below, he invites us to “not remain in silence” and to set upon the task of “raising awareness” to inform others of the reality of the situation. A simple act that, for the Syrians, means “solidarity”. “I hope that my words will be a shout that comes from the whole of Syria and a kind request to all of you. For eleven months, the land that has been the cradle of civilisation, is experiencing one of the darkest moments of its history that spans the millennia. Syria is bleeding. There is not a single city that has been able to spare itself from burying the young and old, women and children. This revolution – different from others by the means and macabre repression it is using – is costing the city of Homs the highest price in human lives. Hart Safsafi, Bab Sba, Bab Amr, are only some of the neighbourhoods of this audacious city, which have continued to pay a constant price in human lives. In these streets, my family has its origins and its memories, while today, those who live there, are facing a daily challenge against death. Only in the last week more than 500 persons have lost their lives, due to the constant shelling that is striking their homes. This massacre of human beings must no longer be tolerated by the whole of humanity. There are no excuses, nor can there be any excuses for these actions carried out by the militia of the Syrian regime, with the goal of bending the city of Homs, given its strenuous and indomitable resistance. The people of Syria – Alawites, Sunnis, Shi’as, Christians, the entire enormous puzzle of ethnic and religious groups – has chosen to no longer accept the silence, striving for the breath of freedom that is common to human nature. The task entrusted to the Syrians abroad and to any person at all, disregarding any differences in faith, nationality, ethnicity, is that of witnessing and being aware of what is happening in Syria. No one should be silent or observe with indifference the continuation of this drama. I invite all of you to begin a campaign to raise awareness, with the aim of informing others of what is going on in this nation that is suffering. Talk with your neighbours, your friends, write, protest and learn – from the Syrian tragedy – to love your neighbour, to not forget about his needs. * Fr. L’écrivain et militant Shady Hamadi, né à Milan en 19…88 d’une mère italienne et d’un père syrien, lance un appel à la communauté italienne et internationale afin que soit énergiquement condamné le massacre de gens désarmés dans son pays d’origine. Il est le fils d’un chef de file du parti nationaliste arabe de la région de Homs qui a subi la torture des aiguillons électriques pour bovins dans les cellules du régime et à la fin des années 1960, et a réussi à s’enfuir en Italie. Etudiant en Sciences Politiques, Shady a déjà pris position à de nombreuses reprises. Voici son appel. “J’espère que mes paroles seront un cri qui s’élèvera de la Syrie toute entière et une demande à vous tous. Depuis onze mois, la terre qui a été le berceau de la civilisation, connaît l’un des moments les plus sombres de son histoire qui s’étend sur des millénaires. La Syrie saigne. Pas une seule ville n’a été exempte d’enterrements de jeunes et d’anciens, de femmes et d’enfants. Cette révolution – différente des autres par les moyens et la macabre répression macabre mis en œuvre – coûte à la ville de Homs le prix le plus élevé en vies humaines. Hart Safsafi, Bab Sba, Bab Amr, ce ne sont que quelques-uns des quartiers de cette ville audacieuse, qui ont continué à payer un prix constant en vies humaines. Dans ces rues, ma famille a ses origines et ses souvenirs, alors qu’aujourd’hui ceux qui y vivent, sont confrontés à un défi quotidien contre la mort. La semaine dernière seulement plus de 500 personnes ont perdu la vie, en raison du bombardement constant qui s’abat sur leurs maisons. Ce massacre d’êtres humains ne doit plus être toléré par l’ensemble de l’humanité. Il n’y a pas d’excuses, il ne peut y avoir aucune excuse pour ces actions menées par la milice du régime syrien, dans le but de faire plier la ville de Homs en raison de son énergique et indomptable résistance. Le peuple de Syrie -, sunnites, alaouites chiites, chrétiens, l’ensemble de l’immense puzzle de groupes ethniques et religieux – a choisi de ne plus accepter le silence, en luttant pour la liberté, aspiration commune à la nature humaine. La tâche qui incombe aux Syriens vivant à l’étranger et à tous, sans tenir compte des différences de foi, nationalité, ethnicité, est d’être témoin et conscient de ce qui se passe en Syrie. Personne ne doit se taire ou observer avec indifférence la poursuite de ce drame.